Here are 30 fun and creative spring activities for kids including spring craft projects, art activities, recipes, and garden ideas. Plus list of picture books all about spring! It’s spring! The leaves are unfurling, the flowers are blooming, and the lambs are frolicking. Actually, I don’t know about that one. Are the lambs frolicking? I don’t see any out my window. But I do see birds building nests and gardens growing. It’s time to get outside and enjoy the spring weather. It’s time to learn what we can from spring and nature and the world opening up around us. And it’s time to explore spring colors and themes through arts and crafts and spring activities. I know how busy you are, though, so I’ve made it easy for you. I compiled a list of 30 spring crafts and activities for your family to pick and choose from, including nature crafts, outdoor activities, and books about spring. There are a lot of good ones here! Choose a couple to try now and pin or bookmark this list to come back to when you’re ready for another spring craft or activity for the kids. Happy spring and happy artful parenting! 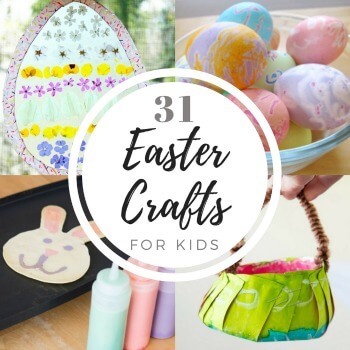 By the way, if you’re looking for ideas for Easter or anything to do with eggs and bunnies, I have an entire post filled with 31 Easter Crafts for Kids (plus art projects, Easter activities, and books!). With spring crafts, we’re often using flowers and other nature items, spring colors such as pinks and yellows and chartreuse greens, and spring themes, such as gardening, baby animals, and nesting birds. Here are some favorite spring crafts for kids and families. Gardening with kids is wonderfully rewarding and educational! If you’re serious about getting started with a family garden, I highly recommend the book Roots, Shoots, Buckets & Boots: Gardening Together with Children by Sharon Lovejoy. For now, here are some posts about making a bean pole teepee (one of our favorite annual gardening traditions) as well as some garden crafts and activities. These spring art activities are simple open-ended explorations. Remember also that you can take almost any favorite art activity and make it perfect for spring by using spring colors and themes. If the arts and crafts ideas above weren’t enough, here are more spring activities for kids, including a nature scavenger hunt, kite flying, and creative play invitations that are perfect for spring. These spring recipes are a mix of kids snacks, breakfast (berry muffins! ), and desserts. Cooking something tasty together is a wonderful way to celebrate any season! Head to the library and check out some picture books about spring. How about you? Do you have any favorite spring activities for kids and families that I didn’t mention? Please share them with us in the comments! Thanks, Marsha! I’m so glad you like my blog! Your clothing line looks great. I’d be happy to send you my media kit with information about sponsored posts and giveaways. The best blog for parents who have small children to engage in, Jean, you have written the blog well. I was wondering how to engage my 5 year daughter and 7 year old son during this spring. Nature craft ideas are really helpful to keep them indoor…. thanks buddy.